This goes to back to our concerns that we didn't get the 2nd max guy. It's clear at age 34 he cannot be an 82 game version of the LBJ we knew. Imagine if PG was here, we wouldn't have fared so poorly while LBJ was out (I mean losing to Cavs/Knicks may sink our playoff chances). Using the cap space to sign KCP/Lance/Rondo on 1 year deals isn't enough to make up for another star level player next to him. Yet the plan seems to be to ride his back for the next 3 years. I can imagine it. Same as I can imagine Randle still doing his coast to coast Bull in a China shop impression. Too bad the FO chose to alienate or dismiss them to completely focus on James instead of a full team. At this point it is just disappointment on my part. Hopefully Magic can put enough All-Stars and role players around a declining James to make a difference over the next 3 years. I wonder if it will even matter, will James be able to check his ego enough to let the proposed fantasy players carry him? I have concerns about Lebron becomes an injury prone player at his age. But I think outside of his recent injury, he is just not giving 100% effort on the court. And I don’t blame him for that. The plan was/is to have a 2nd all star next to him. Now, I'd agree with you if all they wanted was LBJ and no one else, but the FO isn't that stupid (though they were badly out negotiated in the AD saga and have made some puzzling moves). They planned to add PG (which would have been the right move but he chose OKC/WB). They tried to trade for a 26 year old AD (which would leave us competitive now and allow us to build with him later). So this goes back to the original plan: we need a 2nd star. This is one of those statements that still shock me. You don't blame him for not playing hard? For taking the max contract and leadership mantle of your favorite team only to "not give 100%"? Would you give any other player that free pass? Would you be so accommodating if Durant, Davis or Leonard played less then 100% and coasted? How about Ingram or Kuz? They had a tough week, is it understandable if they coast a couple games? Dude, you don't understand what's he's saying. You literally cannot go 100% in a regular season over 82 games. You will break down, especially the load he has to carry. KD has 3 all NBA players around him; Warriors certainly coasted earlier in the season. KL has a very deep team around him, and he has elected to take a bunch of games off for rest this season. AD has been in and out of the lineup with injuries/rest too. I understand what he is saying. Are you understanding me? I'm not comparing the Lakers to the Warriors. Lakers need to find a way to become a playoff team, then become a consistent playoff team, then a contender. No short term quick fixes. Any other player (not just max but any) coasting is an issue. Add in the additional responsibility of being "The Guy" on a rebuilding team just complicates it more. Multiple championship and contending teams have the luxury to take games off and coast while another takes over. Rebuilding teams fighting for a playoff sopot do not have that luxury. You continue to bring up George. If he signed instead of James. If he was injured for 20 games. If the Lakers were in this same position of desperately needing wins to just make the playoffs. Would you be giving him the same pass or making excuses for him as some seem to be doing for James? And yes, I understand he is an aging player that can't give his full effort every night. One of my biggest issues with signing him as the marquee player to build around for the next 3 years. Timeline is off. Doubtful they can surround him with enough players and coaching and develop a Championship chemistry needed to win in such a short window. You continue to bring up George. If he signed instead of James. If he was injured for 20 games. If the Lakers were in this same position of desperately needing wins to just make the playoffs. Would you be giving him a making excuses for him as some seem to be doing for James? So at least you admit stars coast? There is literally no way for any singular star to play 100% effort for 82 games. It's a brutal schedule and a reason you have to pace yourself. Your point on PG makes no sense. If you replaced LBJ with PG (and all the other signings remained the same and he went out with a similar injury), we'd probably be worse off. PG benefits from having some of that burden shared with WB. I would give him the same benefit of the doubt as the sole all star on the team. 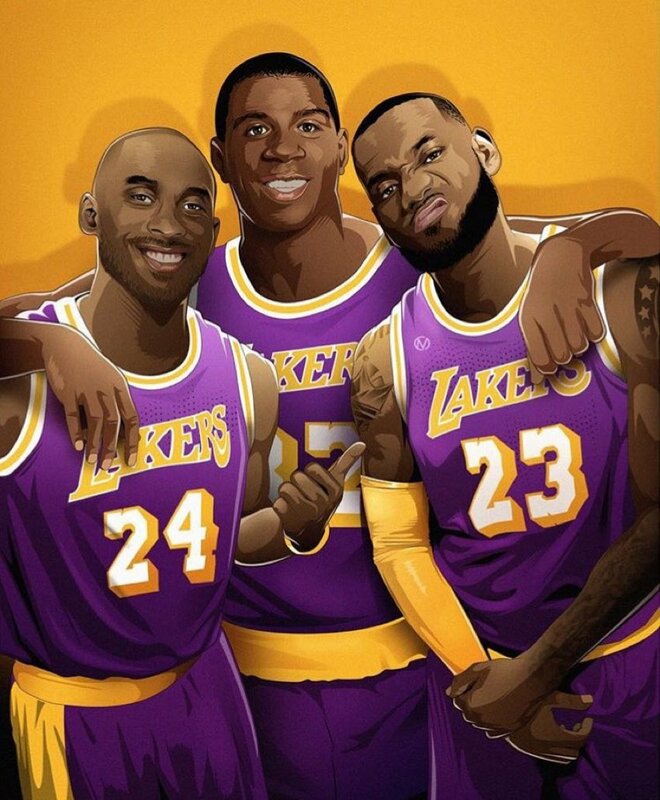 We need that 2nd star so LeBron can enter the "Wilt Chamberlain as a Laker" phase of his career. Rebounding, passing and not having to score a lot of points every single night. A triple-double machine capable of doing it all on the court. Yup. If Wilt came by himself with no Jerry West, etc., would he have won a ring? OF course not. Of course they need a second star. The issue was making James the first one. The desperate mentality of "Win now so we don't waste any James years" is the timeline issue I discuss. Making James the focal point creates bad decisions and desperate options to take advantage of his declining skills. He is the focal point. It is his offense and his team. Hypothetically, lets say they are able to land another All-Star next year. They still need to revamp the roster. Likely 3-4 new starters. Potentially 5-6 of the top 10 players even if they don't do the clear the cupboards trade so many want. How competitive are first year teams? Usually at least a season or two of developing chemistry and tweeking the roster. Or finding the right role players for the bench. Even loaded Prime James teams in MIA and CLE didn't win the first year. Or Kobe/Shaq teams. It takes time to develop a contender. Time that James' timeline does not permit. As critical as I am being , I am not rooting against James, Magic or the team. Just disappointed to see lackluster efforts being accepted by the face of the franchise. Not all on James, but his team and his responsibility to lead by example. Settling for long 3s or poor iso plays and uninspired defensive rotations are not good examples for a young team. The issue was making James the first one. PG13 had the choice to jump in 1st but didn't. He chose to do that asinine 3 part documentary and his mind was already made up. So, if you're the FO, you're telling me (after PG13 has spurned you for OKC/WB) that you turn away LBJ? We were just fine with LBJ/Yutes as the 4th seed whooping the Warriors on XMAS. We were all hugs and kisses after that glorious Celtics win. But now it's gloom and doom? How about a bit of patience and perspective. At least give them until the summer to get that 2nd star. Ever consider he's pacing himself to max out come playoff time? He does this every year, and has been doing it more frequently in the past couple of years. It's the same reason why the Warriors stopped winning 70+ games a year. Yeah. It's the same logic applied when people screamed at the Bulls and Kobe/Shaq Lakers to chase 70+ wins, not understanding the pyrrhic victory. Ask the Warriors team that has the regular season record whether they'd take the Finals win that year or that pyrrhic record. Of course on this team, it's worse, b/c LBJ is the only all star. It's impossible for him to go 100% over 82 games; that's probably why we needed the YUTES to step up more consistently. I think he was wise not to go all out in this one. Save it for when it's more likely to get a win. First, he was playing like since the tipoff. Second, if he's going to play only when he feels like its worth it, then he's not a very good leader. Third, Lebron is getting paid more per game than most of us make in a year, so he should always play with passion. Nothing wise about being a loser. Chamberlain (and might as well add Kareem to the scenarios) both joined damn good multi year contending teams. Both took 3-4 years of adjusting the roster and competing before they were able to win championships as the "2nd star". James does not have that luxury in the modern highly competitive NBA. I look forward to seeing the second max star and the revamped roster next year. But that does not mean I am not overlooking this year or the decline of what was a damn entertaining team that played hard every game. Didn't know how to win in the fourth, but were learning. Remember that team? Did people already forget this game? What do you mean with this? We lost 143-120 at Philly last night. I only remember that game at the moment. That is the game you should look. My issue is that we should NEVER lose by 23 points with Lebron playing. I can understand with him not playing, but we had both Lebron and Rondo on the court, and we're still losing big. We are not discussing a team chasing 70 wins though. We are discussing a team trying to improve past 35 wins and make the playoffs. Hopefully we see a more inspired effort by the whole team against ATL. Because both of those goals still need a lot of work to become reality at this point. But to singularly blame LBJ is missing the point. There was a big expectation that the YUTES would elevate their game so as to collectively absorb some of the missing 2nd max FA's impact. The stretch with LBJ gone has shown that they are improving, but not nowhere near that expectation ergo our current 10th in the WC status. You can't get into the WC playoffs by yourself. I think LBJ is learning that this year. Um, you're proving my point. We're agreeing somewhat. 82 game season is a grind and we don't have a 2nd star to absorb any injuries to LBJ. LBJ + Yutes for a 40 game period were fine; without LBJ, not so much. That's why you need another star alongside LBJ in the current configuaration b/c the YUTES aren't collectively that. It's agenda driven. You(not u yin) didn't like the Bron signing we get it. I think this is what the FO is planning. Having the 2nd star takeover as the #1 guy toward the end of Lebron's contract. However, it doesn't seem like the guys capable of doing it (KD and Kawhi) are heading here this summer. What does that even mean? Most opinions are "agenda driven". Embracing the James signing is "agenda driven". Proposing trading away the developing young players is "agenda driven". Even advocating unrealistic fantasy rosters to support the 2 max plan is "agenda driven". And my opinion of the signing has not changed since it was first being discussed a year ago. As I have stated on multiple occasions I hope Magic can pull it off somehow. I would be thrilled to see James have a championship run with the Lakers. I will be watching every game just as I always do. Rooting for the Lakers! Well I know one thing. Bringing him with this awful contract was a huge mistake. We will regret it for next three years. He lost his touch and his aggressiveness. At the beginning of the year I was happy to have him but now I am sad we have old slow LBJ. I hope but we are running out of time and we have though schedule until the end. Other players also need to step up. Ingram, Rondo, KCP they have to do more if we want to make the playoffs.